Splendid Malaysia, located along the Straits of Malacca, has densely forested hilly areas, sparkling, white sandy stretches, beautiful parks and gardens, an enticing skyline and grand shopping malls, to make your honeymoon a special one. 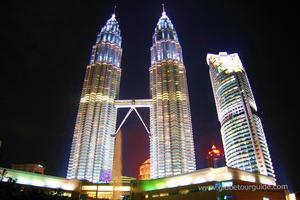 The Malaysia Honeymoon Trip Package will take the honeymooners to Kuala Lumpur, its capital city, which has a great charm. A trip to the Petrona twin towers at Kuala Lumpur, on the elevator, is a visual delight! As you explore the place together, you will be taken to the Malaysian houses of Parliament in Kuala Lumpur, along the beautiful Lake Gardens, which are illuminated every evening, bringing a sparkle to the visitor’s eye. The King’s palace, the national mosque and the Kuala Lumpur Tower are the other visual treats of the capital. Your Malaysia Honeymoon Tour Package can lead you to the Genting Islands, which has an elaborate theme park and is famed for its mini-Disney world, with many outdoor activities and eye-catching indoor activities including casinos and day-night entertainment of song and music, besides a shopping centre that is decorated with lights throughout the day. If you wish to explore its history, then Penang has an abundant legacy of monuments, while Taman Negara offers many adventure activities. Should you wish to indulge in nature’s spell, you can be shown the home of the endangered and rare animal and bird species on your Malaysia Holiday Package. You can also explore ancient caves containing rock paintings, go hiking, white water rafting, rock climbing, surfing, night treks in the forest, visiting Malaysia’s original native inhabitants and waterfalls. Many cultural activities take place throughout the year and you may find yourself caught up in some of these. And when you wish to relax after all these activities, you can go for one of the famous spas, herbal baths, oil massages, saunas and jaccuzis, located in various places. Throughout Malaysia, there are interesting old palaces and monuments. Quaint water villages have community homes built on “stilts”, and the honeymooners may take a novel trip on a canoe to reach them, that being the only mode of transport for the these villages, especially to save them in times of floods. Surely an inspiration! While shopping during your Malaysia Tour Package, you will find that the markets are colourfully adorned with traditional batik, sarongs, tekat, and songket. You can also choose from a vast range of duty-free items and lucrative deals that makes Malaysia a shoppers’ paradise. The Malaysians are habitual of appreciating and are big spenders on jewellery, hence, an exclusive variety of ornaments in gold, silver and intricately studded gems are available to feast the eyes and are worth an added expense, highlighting exquisite craftsmanship. All the above enticing places and activities may lead the honeymooners to satiate their taste buds along the secluded beachside or by the striking sunset, as the foodies’ delight comes from an incredible variety of cuisine happening to be an amazing combination what the different inhabitants have to offer, including rich gourmet food and the ultimate skill of endless hawkers’ offerings, promoting roadside eateries with their specialities. With its visually intoxicating features, Malaysia is considered to be a magnetic honeymoon destination across the world wherein two soul mates, moving towards an endless journey of wedded bliss, can acquaint and discover themselves in mystic privacy, surrounded with enthusiasm and splendour!